Two geisha sisters lead a hard life in the Gion district of Kyoto. After one of them feels obliged to support a bankrupt businessman, the other sister sets up various schemes to get rid of him. Ishun is a wealthy, but unsympathetic, master printer who has wrongly accused his wife and best employee of being lovers. To escape punishment, the accused run away together, but Ishun is certain to be ruined if word gets out. A mistress of a drug dealer in post-war Japan is shocked when she discovers that he is having an affair with her sister. Young servant girl Hamako has just started working for her personal hero, Madame Yuki. Her romanticized view of the Madame is broken immediately, as she is introduced with a list of the Madame's personal problems. In medieval Japan, a compassionate governor is sent into exile. His wife and children try to join him, but are separated, and the children grow up amid suffering and oppression. 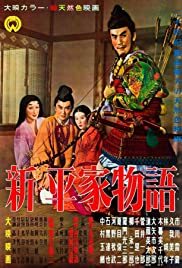 Quite different from most Mizoguchi - there isn't a female protagonist here - TAIRA CLAN SAGA (aka 'Shin Heike Monogatari') is a vivid period spectacle, perhaps most similar to his earlier masterpiece THE 47 RONIN. Working closer to Kurosawa territory, TAIRA CLAN SAGA depicts the tension between the corrupt court and the military class. Ethics, honor and loyalty are central themes, and Mizo's graceful style underscores this in classic fashion. While not quite the equal of Mizo's celebrated string of early-50s masterpieces, this is still a great film - very rarely seen in the US, and very much deserving of restoration and a wider audience. Fans of Kurosawa, Inagaki or Kobayashi's period epics would do well to seek this out.